The Palacio de Velarde is the oldest venue of the Museo de Bellas Artes de Asturias. 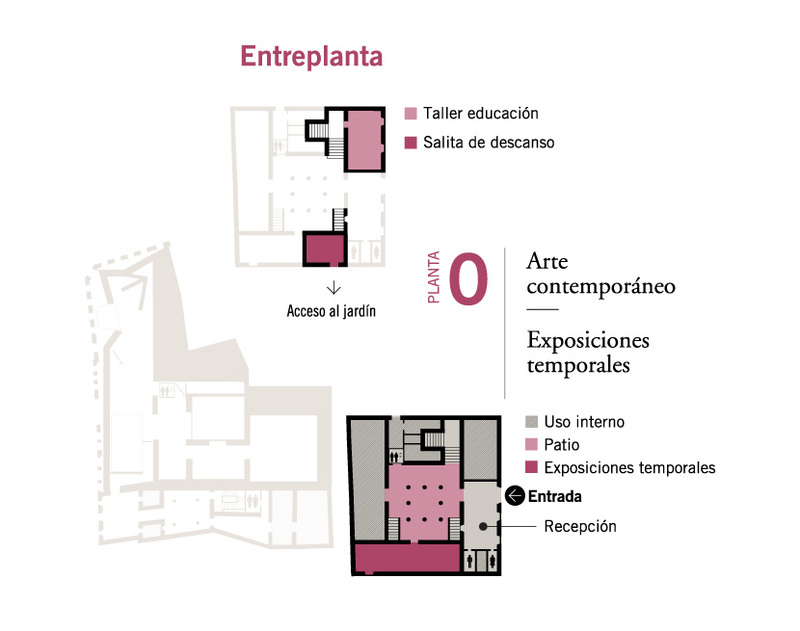 Purchased in 1971 from the ‘Congregación de Religiosas del Santo Ángel de la Guarda’, which had devoted the building to a primary and secondary school for girls, it was adapted to the new needs and use as a museum with the support of the architects Florencio Muñiz Uribe (between 1973 and 1976 and in 1980) and Cosme Cuenca and Jorge Hevia (1992-1995), in the latter case within a plan which also included the Casa de Oviedo-Portal. The building is a Bien de Interés Cultural (“Good of Cultural Interest”) since May, 25th, 1983 (BOE Official Gazette, July, 12th, 1983). Courtyard of the Palacio de Velarde. Photography: Marcos Morilla. The Palacio de Velarde, in Santa Ana Street on the corner with San Antonio Street, is a perfect example of the academic palace architecture of the 18th Century. Designed by Manuel Reguera González (1731-1798), it was erected between 1765 and 1770 for the Councilor of Oviedo Pedro Velarde Cienfuegos. 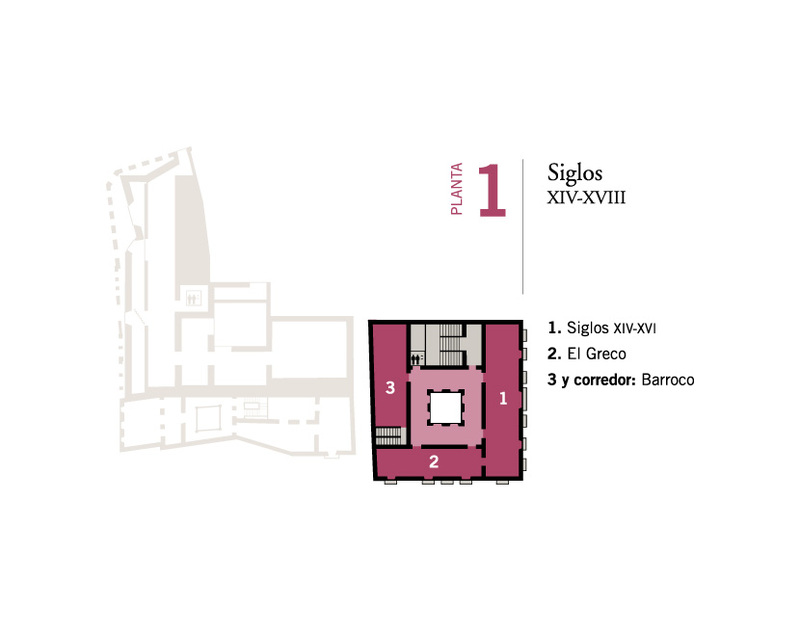 The Palacio de Velarde is conceived as a large, quadrangular block surrounding a courtyard. The main façade (Santa Anta Street) is erected on a plain wall, with the balcony of the first floor and the ostentatious coat of arms standing out located on the upper part of the central axle. The Southern façade, oriented towards the garden, repeats the same distribution scheme although with more simplicity. The building is distributed over three floors: the ground floor, in which the square courtyard stands out, formed by two elliptical arches on each side on monumental Tuscan columns, and the imperial staircase, allowing access to the first floor, originally closed to protect the interior rooms against the harsh climate of the region. On the second floor, the most remodeled one, the suntrap stands especially our. It is formed by five elliptical arches on short Tuscan columns which reiterate the idea of the ground floor. 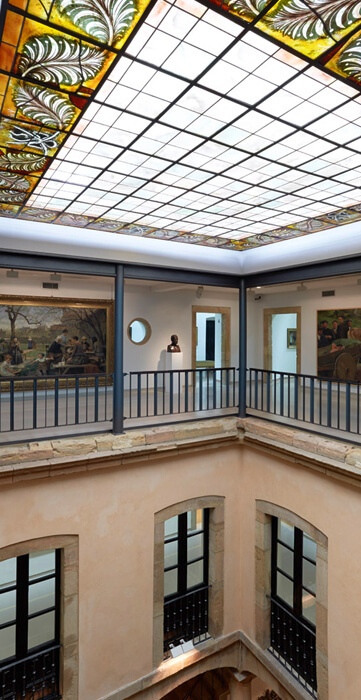 The Palacio de Velarde hosts the best of the historical collections of the Museum (14th – 19th Century) and dedicates some space (ground floor) to the contemporary art and temporary exhibitions. 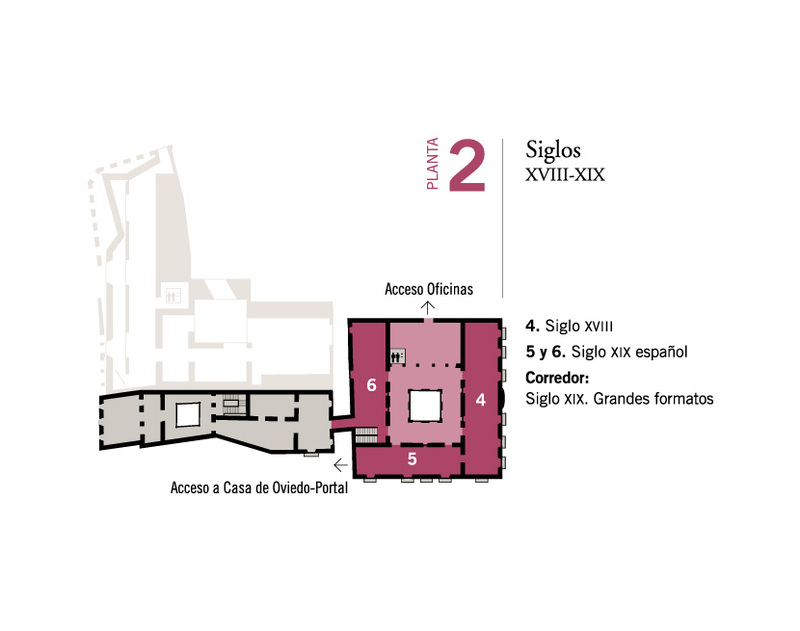 After climbing the grand staircase of the building, where we can admire the Altarpiece of Santa Marina, we accede to the first floor, dedicated to the Art of the 14th to 17th Centuries, with works of such significant artists like Fernando Gallego, Pedro Berruguete, Luis de Morales, El Greco, Zurbarán, Ribera, Murillo, Carreño de Miranda y Miguel Jacinto Meléndez. The second floor (currently closed until March 30th) is dedicated to the Spanish painters and sculptors of the 18th and 19th Centuries, with works of Francisco de Goya y Lucientes and the most important Romantic painters (like Genaro Pérez Villaamil, Federico de Madrazo and Antonio María Esquivel) and Realistic painters (Carlos de Haes, Ignacio Pinazo and Aureliano de Beruete, among others). 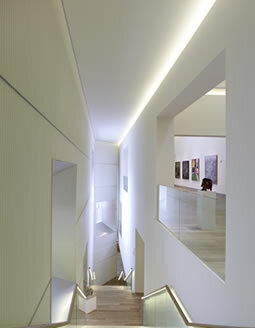 The central space is devoted to large-size paintings, including works of Tipos vascos. Guipúzcoa, by Joaquín Sorolla. 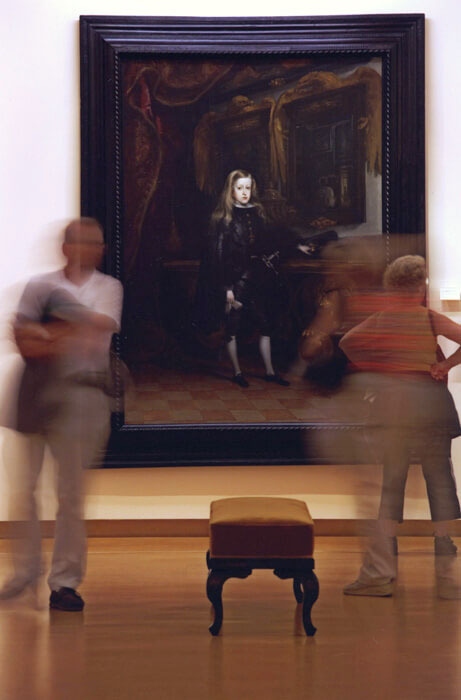 Visitors in one of the rooms of the Palacio de Velarde. Photography: Marcos Morilla. The Museum informs: the Palacio de Velarde is partially closed until March 30th due to the re-assembly of the permanent collection.